With two weeks of true pastry employment under my belt (or apron), I am happy to be back at Ganache. The environment is familiar and friendly and the work is challenging. Receiving a genuine paycheck again has been satisfying; however, the reality is that food industry wages are, in general, meagre. Even at the Pan Pacific, Chef Ted facetiously said after learning about my job offer at Ganache, "the pay here is peanuts, Ganache must be sesame seeds". Obviously, financial gain is not my primary objective, otherwise high-volume cataract surgery would be my calling, not pastry! It is pyschologically gratifying to be paid to do something that I love and of which I am proud. 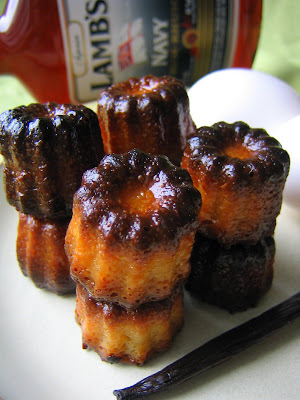 Meanwhile, besides macarons, I have also been making cannelés de Bordeaux at home which are Eric's favourites. Traditionally made in beeswax lined copper molds, these fluted caramelized cakes are ideally eaten on the day they are baked in order to savour their crunchy exterior before entering their soft custardy vanilla and rum centres. The origin of the cannelé is filled with mystique; nuns from the convent of Annonciades in Bordeaux or perhaps, an artisan guild of "canauliers" may be credited with its creation. Regardless, they are very addictive and very easy to make using the silicone molds which I purchased in France. Posted by Charmaine at 9:46 p.m.